PicoSure is the world’s first and only picosecond laser for multiple aesthetic treatment applications. This unparalleled breakthrough in laser technology delivers ultra-short bursts of energy to the skin in trillionths of a second, enabling unmatched photomechanical impact or patented PressureWaveTM. Picosecond pulse width is 100 times shorter than nanosecond technology, enabling photomechanical impact to shatter targets without injury to the surrounding skin. 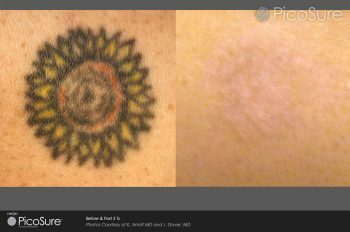 Traditional nanosecond lasers predominantly rely on photothermal action, delivering heat to the pigment and surrounding tissue. • PicoSure uses PressureWaveTM Technology to shatter targets into tiny particles that are easily eliminated by the body.